Saving money can be an uphill battle at times. It can feel like something is always coming up that you didn’t plan for and it screws up the whole month. If you can start saving, even little by little, you can take away that stress when something unexpected comes up. 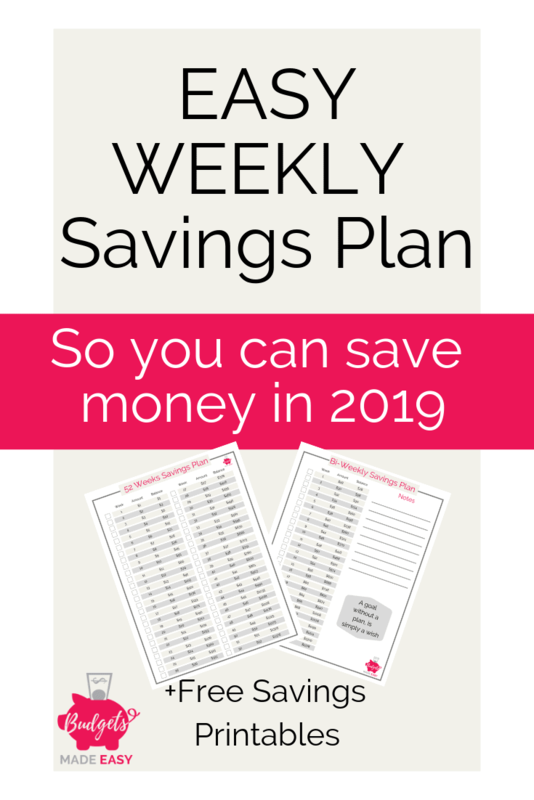 This weekly and bi-weekly savings plan will help you save money a little at a time so you can have a little cushion for when the unexpected comes up. I have created a plan for you that has a weekly savings plan and a bi-weekly savings plan. That way you don’t have to try to figure out the numbers by paychecks. What are the benefits to saving weekly? What if I can’t save money? What If I want to save more than this? 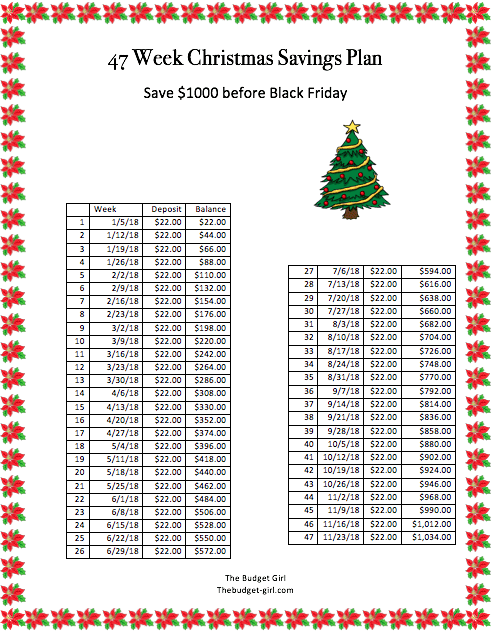 Weekly Savings Plan for Christmas! Saving for the unexpected puts a barrier between you and stress when an emergency happens. Things will come up and that is part of life. The better you can prepare for them the less of an emergency they will be. They will then be an inconvenience instead of an emergency. How many things that you can think of that were an emergency in your life but if you had the money for it would have just been an inconvenience? Most things that we experience in life that we think of as emergencies are really not true emergencies. The majority of things should be planned for by saving. Things will happen and you need to be prepared. It can be helpful to set up saving like a bill and do it weekly. If you get paid bi-weekly, then make it per paycheck. It’s an easy way to save without it feeling like you’re saving. Plan it like a bill and have it come out automatically so you don’t even notice that the money is gone. You can even make it automatic out of your paycheck at some employers. I would highly suggest moving it to a different account and/or bank in order to keep yourself from “accidentally” spending it. Saving weekly also helps keep the amounts smaller and you may not notice it as much. In the Christmas savings plan, the amounts are $32 or $22 a week. That is one trip through a fast food joint for your family. If you can’t save the amounts listed, save what you can. Find ways to cut expenses, like using Billcutterz. They will negotiate your bills for you and save on average 2-5 times more than you would if you negotiated on your own. It’s free to sign up and you only pay if they save you money! There’s no risk and they save you tons of time and frustration. You could make your own savings chart. You can decide what you want to save in a year and divide it by 52 or 26 and that is what you would save either weekly or bi-weekly. Or let’s say you want to save $1000 with in 3 months. You need to save $333 a month or roughly $85 a week. It’s important to break your goals down into smaller chucks so it doesn’t seem so overwhelming. If you don’t have any money saved and I tell you to save $1000 in 3 months, you may think I’m crazy. But if I say to save $85 a week for three months, it may seem more doable. Setting weekly goals helps us stay on track and motivated and more likely to reach our goals. There are apps that will help you save automatically, like Acorn or Digit. Acorn automatically saves your change and invests it for you. Digit saves toward whatever goals you set up and does it all for you. You can also set up an automatic transfer with your bank in order to make it automatic. I would recommend using a seperate account to out the money in in order to actually save it. I would then transfer it to a different bank so you are not tempted to spend it. 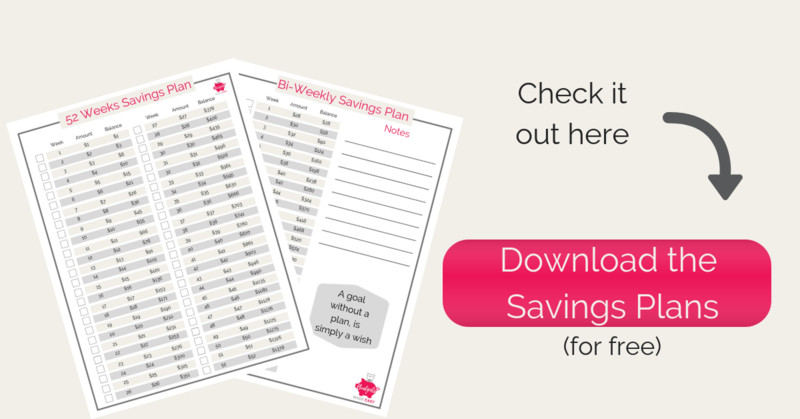 This weekly savings plan is simple and starts out by saving slowly. It increase each week a little bit at a time. At the end of the year you will have $1378 saved which is a great start to having an emergency savings. This bi-weekly savings plan has the same end goal but is broken up by saving per paycheck if you get paid bi-weekly. 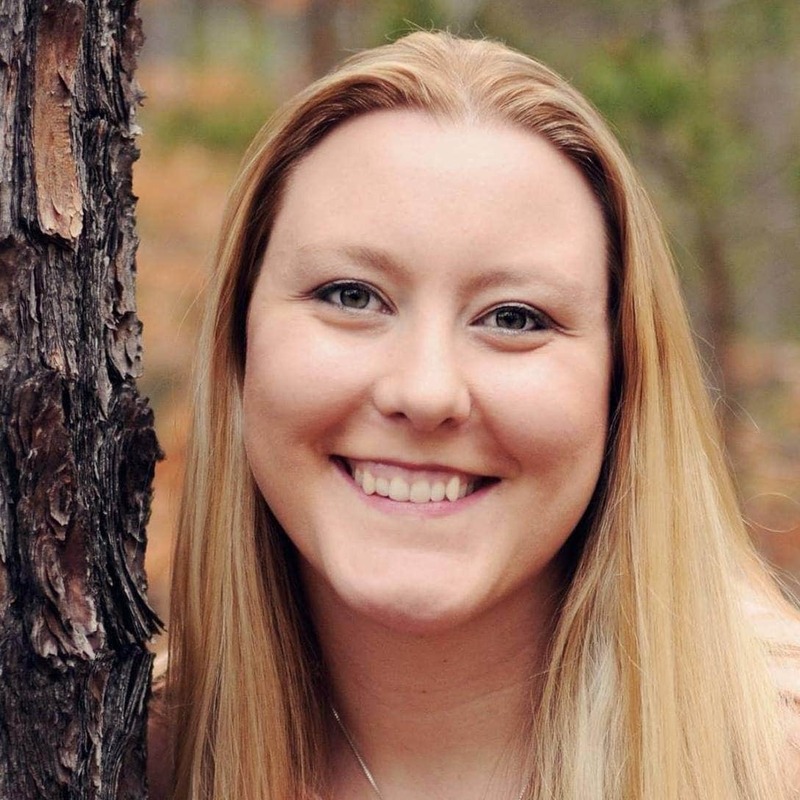 GET THE SAVINGS PLANS HERE FOR FREE! So saving just to save isn’t always enough of a motivator to get us to save. One way is to save for something specific, like Christmas. Do you have a savings plan for Christmas? Christmas comes at the same time every year. Don’t let it sneak up on you next year. It is easy to think that you will have money for it later but even saving a little each week adds up by the end of the year. If you do not have the funds to cash flow Christmas at once, you should start a sinking fund for it. Decide now what you want to have saved next year to spend on Christmas. Let’s say you want to have $1500 for Christmas. If you save $32 a week from the first of January until Thanksgiving, you will have $1500. Depending on how many people you have to budget for, $1500 is a decent amount. It maybe too much or not quite enough depending on your situation.This year our budget was very small because of several things that came up and I quit working to stay at home. Our normal budget is around $1000 but has been as high as $1200. This year we spent right at $800. 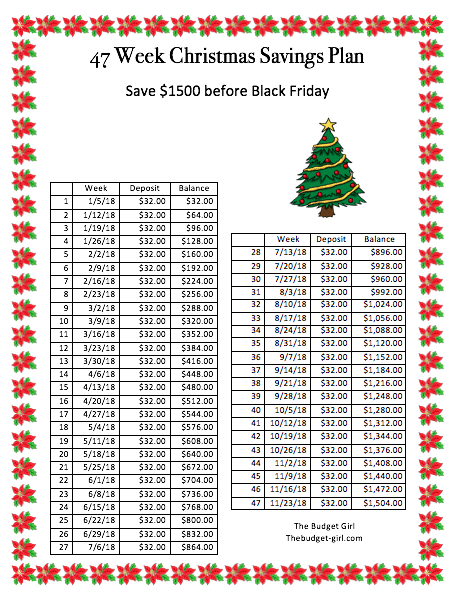 Here is a savings plan to save $1500 by Black Friday for Christmas. This may be over your goal so I have included a plan for $1000 below. It is important to start planning now. I also created a chart for those of you that want to save per paycheck and get paid bi-weekly. 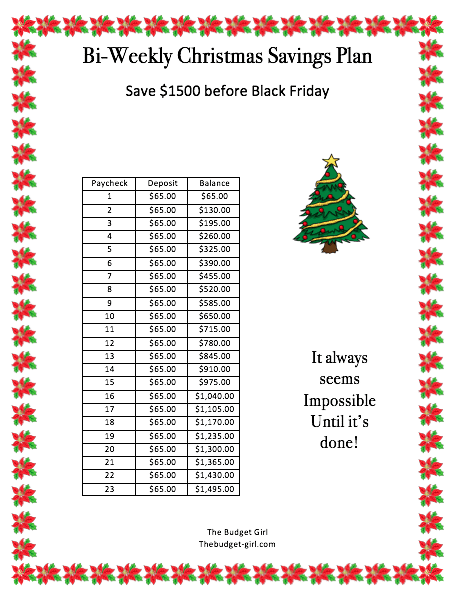 With this plan you will have saved $1500 for Christmas by Black Friday. 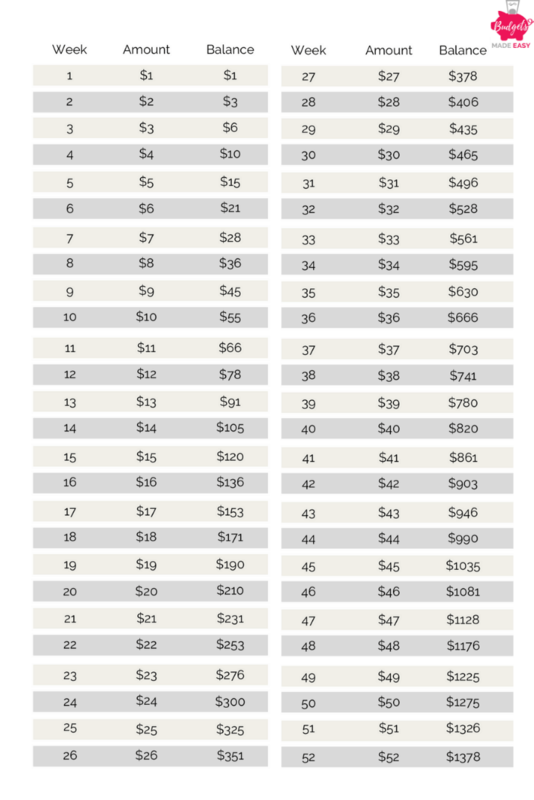 Now if you are only planning on saving $1000 for Christmas, you need to save $22 a week. This plan will let you save $1000 for Christmas by Black Friday. 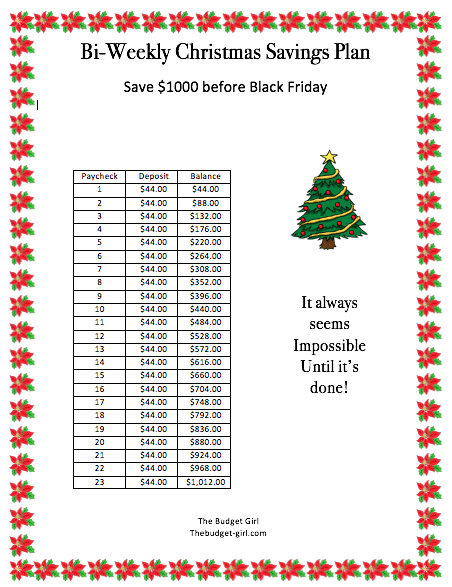 Here is a $1000 bi-weekly plan to save for Christmas by Black Friday. The important thing to remember is to have a plan and write it down! You are a lot more likely to achieve your goal if it is written down. Start saving for Christmas now so that it doesn’t sneak up on you next year! Saving money doesn’t have to be a chore. You can even set up ways to make it automatic so you don’t have to even think about it! Making a plan and then doing it, will help you lower your stress level and overwhelm when something unexpected pops up again. Start saving money today with these simple tips. I’m saving this and starting as soon as possible for next year. It would have been wonderful it we’d have had this little nest egg for shopping this year! Thanks for the motivation! !